A truly fantastic Mama and friend recently sent me a lovely gift, a "Congratulations on Your Blog" gift. It has quickly become one of my favorite Mama Books, bypassing my I-Wish-I-Had-Time-To-Read-This List entirely and going straight to the top of the pile of the books on my bedside table. 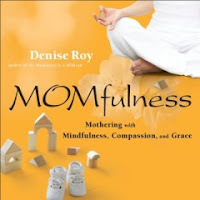 It's called MOMfulness: Mothering with Mindfulness, Compassion, and Grace by Denise Roy. This wonderful book is truly an oasis of calm in the chaos that sometimes masquerades as life. Roy, a psychotherapist and mother of four, is completely tapped into the Mind of the Modern Mama. Aware of the pace at which life goes whizzing by, Roy encourages Mamas to slow down and gives truly practical tips on how to do so. From exercises like "Mouth Yoga" to "Hugging Meditation" to "Honoring-Your-Hands Practice" Roy's words and suggestions will help any Mama stop and take a breath. She also helps us recognize all of the essential, graceful (maybe I should write grace-filled?) and sacred contributions we make to our families' lives and to the world. "When I work with clients (who are mostly moms) in therapy, often the work is in helping them find a mothering and nurturing parent within themselves. Too often their inner voice is a harsh and critical one. As they develop a positive mothering presence within themselves, they are better able to soothe themselves when they are feeling stressed or anxious. Then they are able to mother their own kids in a much more compassionate way." This book is funny, honest and deeply spiritual. I want to buy a copy for every Mama I know. I will def be buying this book. I am excited about it actually!!! It's such a wonderful book, a real affirmation of motherhood. I hope you like it!